Some photographs take me on a journey and this is one of them. It is a softly focussed image of a dancer holding a painted tambourine. It immediately makes me think of the 1920s (although it could be earlier) and is mounted on thin, textured card with the photographer’s name embossed on the lower right. 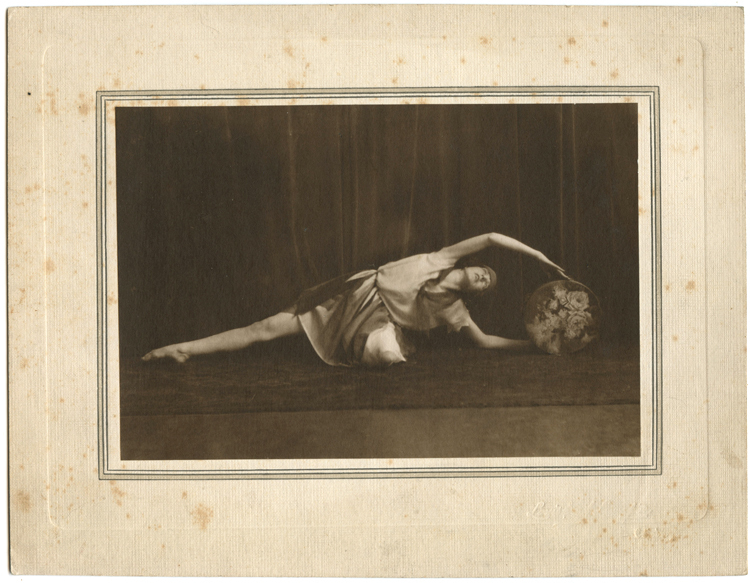 When my daughter, who studies Dance, saw this photograph she drew my attention to the early 20th century American dancer Isadora Duncan, who developed a free and natural dance style inspired by the Greek arts and folk dance. The style came to be known as modern dance, and included floorwork unlike classical ballet. The dancer in the photograph obviously fits this genre, with loose clothing and a pose reminiscent of Duncan, though unfortunately there is nothing on the photograph to identify who she is. During an interview published in The Sketch, Louis states that he joined his ‘nephew’ L. S. Langfier at ‘the firm in Glasgow’ in around 1896. Indeed, Louis Saul Langfier was named alongside ‘uncle’ Louis Langfier in The Edinburgh Gazette, 14 Oct 1898, as co-owner of Langfier and Langfier & Co., 158 Sauchiehall St, Glasgow. According to the interview above, ‘uncle’ Louis then left Scotland in 1899 to set up a London firm, leaving Louis Saul to look after the Glasgow studio. Perhaps Louis Saul Langfier had hit hard times? Or perhaps he simply wished to spend his energies looking after his own company ‘Louis Saul Langfier Ltd’, newly located in Edinburgh (The Scotsman – Friday 01 April 1904)? Thus at first glance Louis Saul appears to have made a success of his second Scottish endeavour, with the firm known as ‘Louis Saul Langfier Ltd’ existing in Edinburgh until it’s liquidation in 1929. Pushing the racist overtones to one side, the article asserts that German photographer Carl Henrich T Shmidt is ‘manager and principal shareholder in the high class photographic business of Louis Saul Langfier Limited at 60 Princes Street (Edinburgh)’. Furthermore, it states that Mr Schmidt had been the principal shareholder of the firm since 1910 or thereabouts. Which begs the question… where was Louis Saul Langfier after Mr Schmidt took over the Edinburgh studio? I have a theory, as suggested by entries in the British Telephone Directory archives. In 1910 and 1911, ‘S. Langfier’ is listed as Artist & Photographer in James St., Harrogate (Yorkshire). And from 1913 to 1921, a photographer by the same name is listed at three different London addresses. The name possibly refers to Samuel Langfier, father of Louis Saul and Adolph, who died in 1919 aged 78. But I think it likely that the two sons, particularly Louis Saul, were in fact running these businesses. And Louis Saul is living at one of the London addresses, 115 Queen’s Road, Westminster, according to the 1919 Electoral Register for London. Finally, another of the London addresses, 123 Victoria Street, Westminster, is associated with Louis Saul’s wife, Pearl Lyndon, who herself is a fascinating character with a complicated story (and the subject of my next blog post). Which brings me back to the photograph of the dancer at the top of this post. Should we just assume it to be the work of Louis Saul Langfier, because of the embossed signature? Or would it be better to attribute this work (and presumably many others) to photographer Carl H T Schmidt? After all, credit where credit is due! Any mistakes are my own! Please feel free to contact me with corrections/further information. The photographer was Frederick William Edleston Sharples, born 1867 in Blackburn, Lancashire. In 1911 he and his family were living at 4 Limbrick, Blackburn, the same address as his photographic studio. I came across an interesting news snippet in the Preston Herald, Wed 19 Jun 1907 that relates to Mr Sharples. He and another man Henry Charnley were driving from Blackpool to Burnley when they collided with a tram in Preston. The car sustained £35-worth of damage, and the men sued Preston Corporation (owners of the tram) for the repair costs. The case went to court and the details of the accident seem somewhat extraordinary by modern standards; the men were over-taking two carts when they saw a tram coming towards them. The car was trapped by the carts to the left and two lorries to the right and therefore had nowhere to go, so the driver of the car (the report doesn’t specify) ‘put up his hand to the driver of the tram as a warning of the position and to make his presence known’! The car apparently stopped, the tram didn’t and, well, you can probably guess that the car was damaged. And a tyre was burst. Despite this, no-one was hurt and the men continued in the car for the remainder of the journey. The passengers of the tram asserted that it was the tram that had came to a halt, and that the motor car ran into them. But despite this contrary evidence, and after two weeks of deliberation, the case was found in favour of Mr Sharples and Mr Charnley, who were awarded £35 7s 5d, with costs (Preston Herald, Wed 3 Jul 1907). I do hope Mr Sharple’s dog found a loving home, and that the gun found a safe pair of hands! Newspaper clipping courtesy of the British Newspaper Archive; The British Library Board. Further research carried out using Ancestry. This charming portrait is housed in an oval cardboard frame, which is signed (more clearly on the original) ‘Mr & Mrs Alf Dodgeon’. When I see an unusual name such as this I give a little cheer, since it makes identification so much more likely. A quick search of the census brings up very few candidates, with only one Alf(red) Dodgeon of roughly the correct age. Born in Nelson, Lancashire, Alfred and his family can be found on the 1911 census living in Burnley. He was 55 at the time and working as a cotton manufacturer. He and his wife Elizabeth (Colbert) had been married for 29 years and of their five children, three had reached adulthood. In the course of scouring the internet for information I came across several references to Alfred’s interest in photography. He appears to have won prizes in competition and even had a photograph published in The Amateur Photographer magazine, 1907 (vol.46, pg.313). All of which makes me wonder if he took this lovely photograph of his wife himself? Alfred retired from his workplace Carrington and Dewhurst Ltd in 1932, as reported in the Nelson Leader (Friday 17 June). I hope he was able to indulge more time in his photographic hobby – it would be wonderful to see other examples of Alfred’s work, if any exist! This beautiful portrait was taken by photographers Leslie Bros. of Bolton and Blackburn. I have no information about the sitter (the reverse is blank) but a little digging about the photographers reveals that, despite their title, they weren’t actually brothers. Their relationship appears to have been strained to the point where not only did the Company (Leslie Bros.) dissolve, but they were no longer ‘brothers’ at all! In fact, Leslie Bros. were a working partnership between Fred Read of Liverpool, and Thomas Dent of Nottingham. The dominant partner appears to have been Fred Read, who had previously worked with Arthur Shaw under the name Fred Arthur, and who later in 1916 formed the Company Fred Arthur Ltd with another colleague, H W Blunt. As for Thomas Dent, all I know is that he married his sister-in-law in 1914. His previous wife, Sarah Elizabeth Dent (nee Haskett) is present on the 1911 census, but in 1914 a marriage took place between Thomas Dent and Florence N Haskett. What happened to Sarah, I don’t know. Nor do I know if Thomas continued in the photography business after the demise of Leslie Bros. Interesting as it is, none of this identifies the girl in the photograph. But judging by the quality of the image I think it a shame that Fred and Thomas couldn’t settle their differences and retain their ‘brotherly’ working relationship for longer. Newspaper clipping courtesy of the British Newspaper Archive; The British Library Board. Further research carried out using Ancestry and The Gazette. 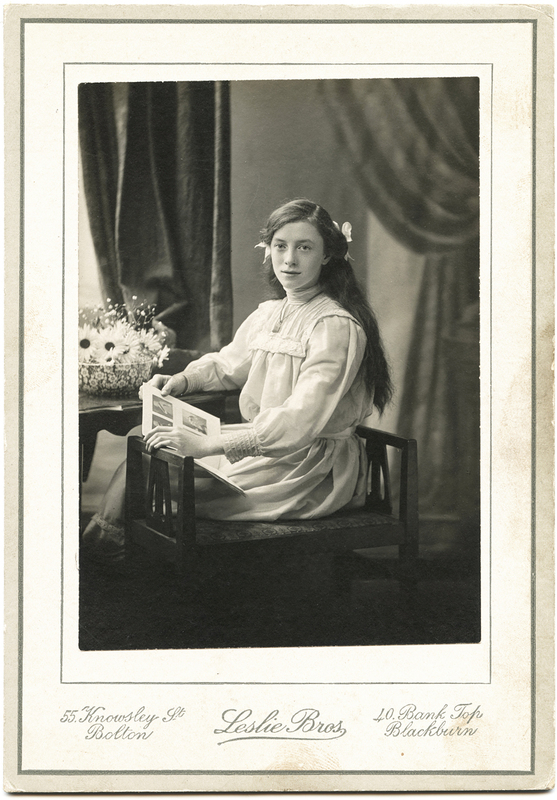 I just have to share this cabinet card of a beautiful young woman staring directly into the camera. 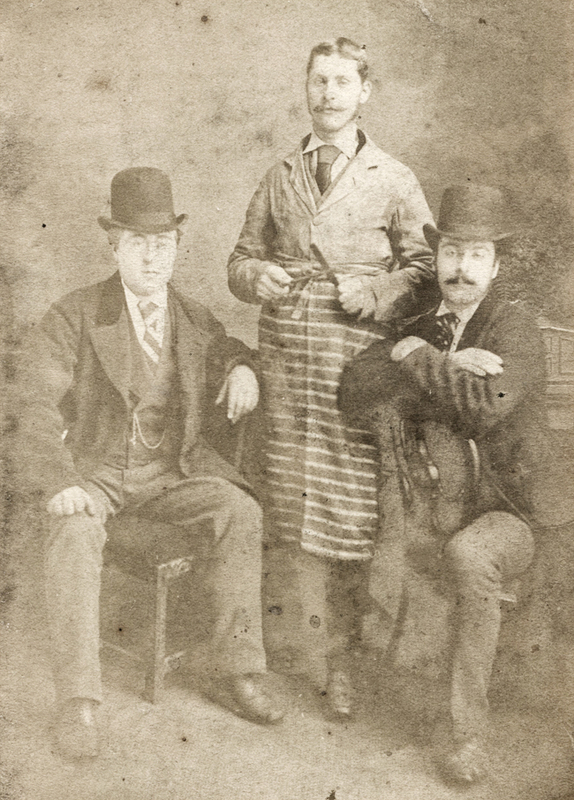 Taken by photographer James Holgate of Bridge End Studio, Burnley, it probably dates to the 1880s, the period in which Mr. Holgate was most active. Unfortunately there are no clues as to the identity of the woman (the reverse of the card is blank). To my eyes she resembles ‘Mary (Patsy) Cornwallis West‘, although this could simply be due to the fashion of the time. 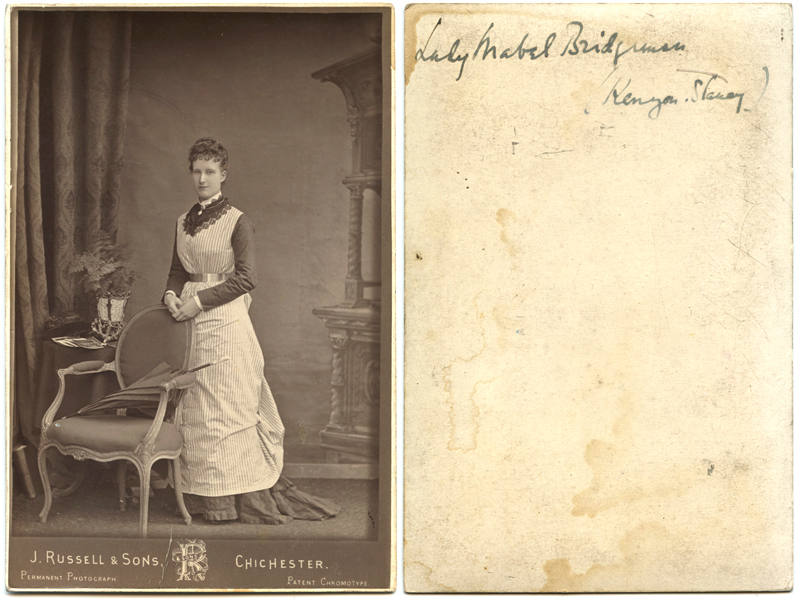 This cabinet card of Lady Mabel Bridgeman is a copy of the original, although not a recent one. She was born in 1855 (the eldest child of the 3rd Earl of Bradford), so I would guess the photograph was taken around 1880. In 1887 she married William Kenyon-Slaney who, having excelled at football at Eton, was selected to play for England. And in 1873 he became the first footballer to score a goal in an international match. Perhaps this makes Mabel the original footballers’ wife? Although, by the time they married his footballing career was over and from 1886 until his death in 1908, Kenyon-Slaney acted as Member of Parliament for Newport, Shropshire. There are numerous mentions of Lady Bridgeman (later Lady Kenyon-Slaney) in the newspaper archives, most of them being society reports. She mixed in the same circles as the British royal family and met Queen Victoria on more than one occasion. The photograph below was taken on a visit by the Prince and Princess of Wales to Bradford, with Lady Bridgeman sat on the front row, next to Mary of Teck (Princess of Wales and later Queen consort). Mabel passed away in 1933 at the age of 77. She was buried next to her husband at Ryton Church, Shifnal, Shropshire. According to the Staffordshire Advertiser 4th February 1933: There were many floral tributes, one from Lord Harewood and the Princess Royal being of pink carnations, with the inscription “In loving memory from Harry and Mary.” The ‘Mary’ in question was the daughter of Mary of Teck. Newspaper clipping/quotes from The British Newspaper Archive © THE BRITISH LIBRARY BOARD. ALL RIGHTS RESERVED. I particularly like cartes de visite that have photographs taken outside, such as the one above. I am struck by the natural lighting, and how the baby appears to be wriggling causing mum to hold on tightly. This second image shows two men posing on a stile. It’s as though they are taking a break during a walk. The photograph is badly faded and I had to do some processing to bring any detail out (including a thumbprint in the middle!). This third and final image looks as though it might also be outdoors. In a back-yard perhaps? To me, the lighting is different to the previous two. So perhaps it is a photographer’s studio, set up to look like the outside. 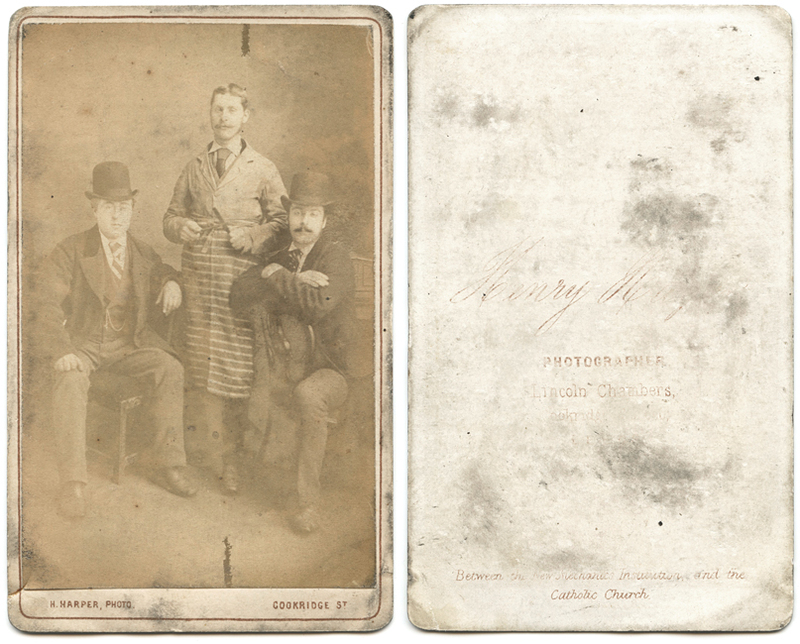 A pity, then, that all three cartes de visite are unmarked and the photographers unknown. That might at least have provided a clue.